While it may seem like the 2012 presidential election has been analyzed to death, the recent release of the Census Bureau’s November election survey points out the key role that minority voter turnout, especially for blacks, played in determining the outcome. Until now, most of what we knew came from the National Election Pool exit poll which elicited Election Day candidate preferences of voters. The new, larger survey from the Census Bureau permits an examination of the voting-eligible population and the extent to which they turned out to vote. These turnout rates tell us a lot more about the enthusiasm, or lack thereof, among different groups. Already, the Census Bureau’s report trumpeted the historically noteworthy finding that black turnout rates in 2012 exceeded that of whites for the first time. This, in an election when white turnout declined significantly and Hispanic and Asian turnout inched down modestly from 2008. The rising black turnout can be viewed, to some degree, as continued strong support for the first black president. The downturn of white turnout might be attributed, in part, to a lack of enthusiasm for either candidate or politics in general during a sluggish economy. Before the election I made the case that a Democratic win would require a high minority turnout rate to counter what I then thought would be high turnout on the part of an energized Republican-voting white population. According to these new data, I was wrong about the rise in white turnout. But the question still remains: Was high minority turnout necessary for Obama to have won the national vote? To answer this question now and in the future, an examination of the role of turnout in the context of the changing face of America’s electorate and the strong racial and ethnic preferences for Democratic and Republican candidates provides insight. From purely an accounting perspective, shifts in election outcomes can be viewed as a product of (1) demographic changes in the eligible voter population; (2) changes in the turnout of different groups of eligible voters; and (3) the candidate preferences of those who vote. A look at the patterns for the three previous elections shows a striking move toward the Democrats on each of these dimensions. With respect to eligible voters, the (typically Republican-leaning) white share of the electorate declined from 75.5 to 71.1 percent between 2004 and 2012 (Figure 1). During this period, the (typically Democratic leaning) combined black and Hispanic electorate rose to approach nearly quarter of eligible voters—a fraction that will rise in the future as more U.S.-born Hispanic children reach age 18. In contrast to the constant shifts in eligible voter demographics, racial and ethnic trends in turnout and voter margins take a sharper turn after 2004. White turnout continued to dive after the 2004 election when it was at a post 1992 high (Figure 2). In contrast, minority and especially black turnout moved in the opposite direction. The black turnout rates of 64.7 percent and 66.2 percent in the past two elections were the highest since 1968 when Census surveys began. 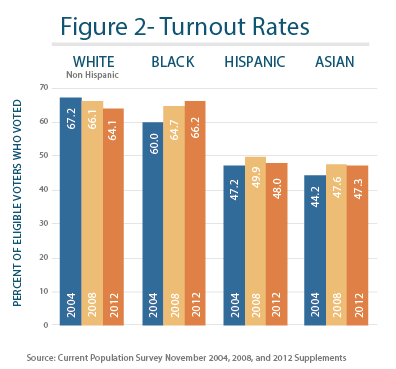 Hispanic and Asian turnout improved markedly after 2004. For both groups, turnouts for the 2008 and 2012 elections were higher than any year since 1992. For whites, the 2004 Republican margin was high by historical standards at 17. It declined in 2008 but then rose to an extremely high 20 in 2012—the largest white Republican margin since the 1984 Reagan-Mondale election. The result, of course, was Obama wins in both 2008 and 2012. But how much of this is due to the rise in minority turnout and decline in turnout for whites? 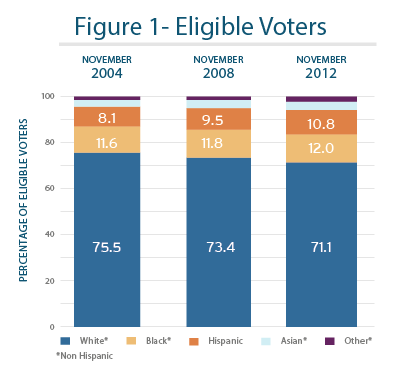 To assess the impact of turnout alone on the 2012 election I assumed that the national electorate had the size and racial and ethnic composition of the new Census survey and applied to it the more “Republican favorable” turnout rates of 2004 for each racial and ethnic group, as shown in Figure 2. This of course resulted in more white voters and fewer minority voters than actually occurred in 2012. To these voter populations, I applied the actual 2012 voting margins as shown in Figure 3. The result of this exercise was a small 2012 Romney win of 9,000 votes—a virtual tossup. Thus it might be said that the high minority and low white turnout rates of 2012 were responsible for Obama taking the national vote, irrespective of the changing demography of the electorate. To see how much difference the higher 2012 turnout of minorities alone made in the final outcome, I conducted the same exercise assuming the “low” 2004 turnout rates for blacks, Hispanics and Asians, but with the actual 2012 white turnout rates. Under this scenario, the 2012 election is close with Obama ahead, but barely. So we might say that the high turnout of minorities, and blacks especially, did make a difference in the outcome of the 2012 election. As a final exercise, I produced projections for the 2016 and 2020 elections which adjust Census Bureau population projections to estimate eligible voter populations by race and ethnicity in those years. Again, I contrast election outcomes, assuming 2004 “Republican favorable” versus 2012 “Democratic favorable” turnout rates, but in each case applying 2012 voter margins to each racial and ethnic group. This time, the Democratic candidates win under each scenario in each election, though with smaller margins when 2004 turnout rates are assumed. What this tells me is that turnout will be less important for Democratic victory as demography changes in their favor, though they must maintain their strong voting margins among blacks, Hispanics and Asians. For Republicans, the latter projections show that they cannot count primarily on white support to take the White House. 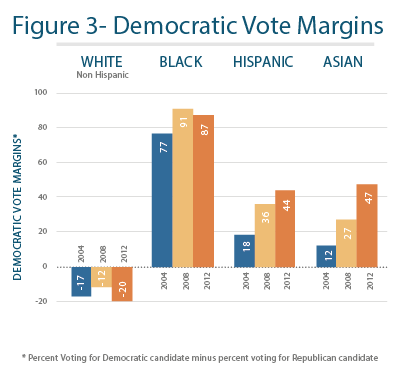 Even assuming high 2004 turnout rates and 2012 Republican voting margins for whites, they cannot win unless they also peel off more votes among minorities. In this regard, demography indeed becomes destiny.